A long-time music promoter, boxing manager, community banker, and vintage record collector, Gene Aguilera can now add author to the list of the colorful callings in his life. In his new book, Mexican American Boxing in Los Angeles, Aguilera offers a profoundly researched history of the sweet science. 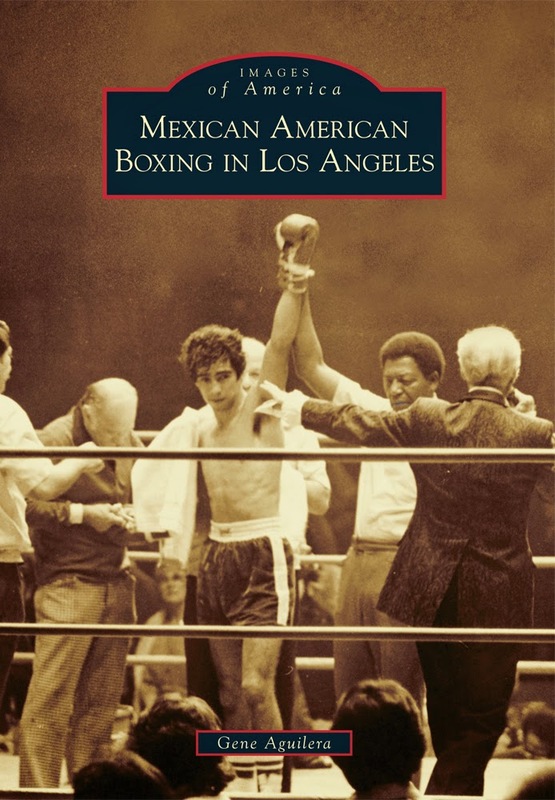 A meticulously documented study, the book is also exhaustively photographed and includes a vast collection of memorabilia that documents the length and breadth of Latino boxing in Los Angeles for well over a hundred years. The former manager of bantam weight title fighter Ruben “El Puas” Olivares, Aguilera is a yearly guest at the Boxing Hall of Fame and has assembled a history here that has, until now, been missing in a city that is so fixated on spectacle, pomp and circumstance. Mexican American Boxing is a thrill ride you won’t be able to put down. Told in a dynamic style that parallels the one-two punches, the combinations and the staccato pummeling of two opponents in the ring duking it out with heart, mind and soul, the book is at once a love letter to the heroes of Aguilera’s childhood and a sports record that details win-loss-draw results for over a hundred of fighters. Naturally, the names of working class Chicano suburbs such as Vernon, Bell, Southgate, La Puente, the San Gabriel Valley, Whittier, Pomona, San Fernando, gritty inner city housing projects such as the Pico Aliso Village in Boyle Heights turn up often as the home turf for many of the fighters profiled. Likewise, the names of states and cities in Mexico—where many of the young fighters were born before coming to Los Angeles as children—read like a litany of heritage and pride. From the September 5th, 1904 bout between hard drinking, card sharking Aurelio Herrera and champion Battling Nelson through the uptick in the popularity of the sport during the 1940, to the recent golden era of Oscar de la Hoya and his Golden Boy empire, the book is a look at homegrown boxers from a historian’s perspective and a serious boxing aficionado’s emotional connection to the sport as well as the cultural community that spawned this veritable army of boxing stars.